« Little People’s Ambient Chamber Music. Top Ten Albums of 2012 by John Diliberto. John Diliberto’s Top Ten Albums for 2012. 2012 will be a year marked by really good albums, but not necessarily groundbreaking, earth shattering or definitive works that place any one release ahead of the pack. There are a few albums I could’ve picked as number one, and the remaining order is mutable. But this is what I settled on when Echoes affiliate WXPN called for my Top Ten Albums and Songs for 2012. It took me awhile to settle on Hammock’s Departure Songs as the number one release. For shear ambition this might be the most daring album of the year, a double CD of their shoegaze electric chamber rock. This album has reverb of oceanic depths and layers like shimmering strata. Departure Songs can be overwhelming, even oppressive in it’s unrelenting darkness, but you can sink into this music of guitars ringing in echo, vocals mixed into a ghostly haze and string quartets sawing into the dark night of loss. Thierry David’s Stellar Connection was the number 1 disc on the mid-year Best of Echoes 2012…So Far list and still could be. When I wrote about this April CD of the Month I called it a defining albums which “over the course of an hour, Thierry David carries you on a journey that sometimes dips into the luxurious Pink Floyd-in-a-lounge trance of “A Familiar Blue Stranger” or drops into the magnificent void of “A Silent Voice Answers” with growling harmonics worthy of Karlheinz Stockhausen or Steve Roach. The most overlooked album of the year was Liftoff’s Sunday Morning Airplay. This DC area collective with members from Thievery Corporation, Fort Knox Five and elsewhere turned in a “nostalgic meeting of 60’s pop psychedelia and chilled electronic modalities.” Their Echoes interview was also one of the most fun pieces of the year. I always smile when I listen to this album. It doesn’t get any more pure, simple, grounded and serene than Amanké Dionti by Ablaye Cissoko & Volker Goetze. Cissoko has a voice that tugs on the soul and matches it with impeccable and plaintive kora melodies. If Miles Davis had played with African musicians, he might have sounded like Volker Goetze. African serenity at it’s best. 2012 saw the return of Dead Can Dance, and their album, Anastasis, did not disappoint. They once again took took deep atmospheres, ritual songs and supralingua dialects to ecstatic, transcendent heights. It was the Echoes September CD of the Month. 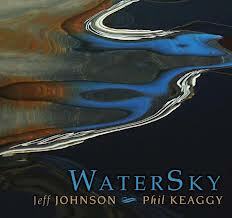 Jeff Johnson & Phil Keaggy’s WaterSky is the November CD of the Month. Like it’s predecessor, Frio Suite, it combines intimate interplay of guitars and keyboards, with expansive sound design in a music that is both cinematic and introspective. You just want to wrap yourself up in their sound. Raygun Ballet may be the leftfield album of the year. Put together by John-Mark Austin, World That Wasn’t is a nostalgic electronic trip using snippets of 50s and 60s radio and film sound clips to reveal the world we thought we’d be inhabiting in the 21st century. And he does it with beautiful melodies and sound design. Where are our jetpacks? The Raveonette’s Observator is the only non-Echoes release on the list this year. Their high energy, psychedelic rock makes this one of the few albums that I would listen to, and then listen to again, immediately. Rounding out the list is Sigur Rós’ Valtari, a nice bookend with Hammock’s Departure Songs, although Sigur Rós brings a lighter touch to their sound design with a mix of gothic ambiences, and quaint keyboard sounds mixed with Jonsi’s ethereal falsetto. Like I said, the placement of these albums is almost arbitrary and others not on this list, including Todd Boston’s June CD of the Month, Touched by the Sun, Coyote Jump’s May CD of the Month, Waking from the Roots and Forastierre’s From 1 to 8, our February pick, could’ve easily been here. And they will be in our 25 Essential Echoes CD list for sure. Look for that in early December. If you subscribe to Spotify, here’s a playlist with all these albums save a couple that didn’t seem to be in the system. Five of the CDs on this list were Echoes CD of the Month Club selections Sign up forEchoes CD of the Month Club now and you will not only receive the November CD pick, Jeff Johnson & Phil Keaggy’s WaterSky, but our December selection, Hammock’s Departure Songs AND Tangents – The Echoes Living Room Concerts Volume 18 as well. With the Echoes CD of the Month Club, you get great CDs like these coming to you each month. Join now and you’ll get Watersky plus, Departure Songs and Tangents – The Echoes Living Room Concerts Volume 18. Follow the link to the Echoes CD of the Month Club and see what you’ve been missing. This entry was posted on November 16, 2012 at 1:04 pm and is filed under CD of the Month. You can follow any responses to this entry through the RSS 2.0 feed. You can leave a response, or trackback from your own site. I like Tame Impala, but their stuff doesn’t hold up for me across an entire album. And I liked the previous one a bit more. 2012 isn’t over yet. Isn’t it premature to announce this list before the release of Scott Walker’s “Bish Bosch”, which is likely to upset it? On my list? Highly unlikely. His album should be on most top 10 of 2012 – should not be missed! Clearly somebody trawling best of lists to hype Jake Bugg, a run of the mill folk artist with only a four song EP out. Maybe where you lived he only had released a 4 song EP, but in Europe his album had been out 2 months or more, and its, now looking back, much stronger than Dead Can Dance album, which, as always, sounds great after a few listenings, but doesn’t stand the test of time, not as a classic album . Alt J – An Awesome Wave and Neil Young and Crazy Horse – Psychedelic Pill. I definitely agree with you on your number one selection artist’s album for 2012, that is, Hammock and their “Departure Songs.” To me Hammock’s music inspires the imagination and spirit, and, what I find very appealing in their music is their “continuity” of melody, that borders on their melodies as having an mesmerizing appeal. If I can go back in time, one of my favorite “New Age” multi instrumentalists is Kitaro, whom, if I’m not mistaken was a past in person guest to the Echoes studio that you interviewed. Much of Kitaro’s best music that I recall listening to is no longer in print (unfortunately). “Moon-Silvered Clouds” and “Earthshadow.” These two tracks are real “gems” from Deuter. Words can’t describe the reflective, contemplative, and inspirational melodies that really brings the love of nature to the listener in Deuter’s artistic, musical expressions. I listen to “Echoes” via WMEH-FM 90.9 on MPBN (Maine Public Broadcasting Network) radio. Your show used to be “aired” on Monday, Tuesday, Wednesday, Thursday, and Saturday from 11PM to Midnight. Unfortunately, MPBN radio recently only “airs” your show now on Saturdays 11PM to Midnight. I had emailed MPBN to restore “Echoes” original show time hours, but as of Saturday, June 1st, 2013 no restoration of your show’s original “air time” scheduling was implemented. Thanks for playing really inspirational and contemplative music that I find very appealing John. I really enjoy the selections played for your “Echoes” audience.